When mandibular defects occur following tumor ablation, trauma, infection, or necrosis, anatomical reconstruction becomes necessary to restore proper form and function. Prior to any mandibular rehabilitation, involving resection of the TMJ or not, the function of the stomatognathic apparatus, including the teeth, muscles, and the temporomandibular joint, needs to be taken into consideration for an optimal surgical result. For obvious reasons, this is especially important with disarticulation of the TMJ in oncologic, necrotic, infective, and traumatic settings, which inherently have unique management challenges and reconstructive nuances. 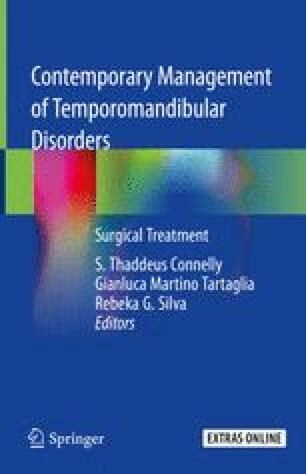 In this chapter, we review the various TMJ reconstructive options and their applications in the settings of resection defects that result from tumor ablation, trauma, infections, and necrosis.